Traditional witchcraft is the art of forging the world in accordance with ones Fate – but it is also the art of shaping Fate into be good and true as much as forging the world to bend to your will and make all Nature still in your moment of regal impossibility where you are One. This turns the Witch into a worker of Fate – and this calls upon the need to know the secret alchemy within creation – and in particular nature herself. Any attempt of defining traditional witchcraft is always challenging – as is the definition of the practitioner of this art, ‘the witch’. Andrew Chumbley referred to it as the nameless art, Scandinavian cunning people call it simply ‘The Art’ and the Greek poet Kostis Palamas called it ‘what has yet no name’. It is actually the namelessness of witchcraft that defines it, which gives an interesting contrast to the Basque saying: ‘If it has a name, it exists’ – suggesting that the naming itself is endowed with magical forge and force. So, how do we discuss formal and logical about witchcraft? We simply don’t – because the Art speaks with the heart and are understood by the mind – and in this process the axis for understanding the Godhead and all things divine in creation is made erect and upright. The term ‘witchcraft’ and its many aliases ranging from malefic in general to sortilege and magic, have since Mesopotamian time been condemned. This condemnation was continued in the Bible, where we find the famous passage in Exodus 22: 18, telling that we should “not suffer a witch to live”. The term in Vulgate translated into ‘witch’ is ‘maleficos’ – ‘evildoers’. In 1. Samuel 15: 23 it is stated that the practice of witchcraft is condemned. We find in Vulgate that what is referred to as ‘witchcraft’ in KJV is from ‘magis’ – so here magic is then equated with witchcraft. These two examples should be sufficient to suggest that the nature of witchcraft – what this art really is - have been subject for faltering attempts prior to the Vulgate. It seems that the common denominator is that it is something that generates social insecurity in its lack of taxonomy. This something meddles with the invisible world and is not only difficult to understand – but the practitioners never reveal much either. Secrecy often calls upon suspicion and a host of ideas are formed as one attempts to gaze through the black mirror that denies reflection. Those of the blood do understand why the Art is this way and do adhere to its secrecy and namelessness as they walk the worlds in whispers and rumours. This is just one of many things that makes the marked one noticeable. This factor has made some people to assume the term being sort of vacant for meaning. Colored by the modern demand for defining everything and place it in its proper box a great variety of modern practitioners have adopted this once pejorative term to define a set of pagan, folkloric or new age practices. In doing this they create councils and found traditions without the minimal understanding of what the traditional craft is about and establish and continue errors – as well as obscuring the nature of witchcraft even more. Two poles seem to be particularly present today. One is Wicca that has turned into a neo pagan nature religion and is referring to themselves interchangeably as witches and wiccans. At the other pole we have re-constructionists that generate illusory traditions upon figment of folklore and pagan customs – and name this as traditional witchcraft. But a witch is not a pagan – but a pagan can be a witch. There is also a contemporary increase in condemnation of witchcraft – based in the beliefs that the witch is an ‘evil doer’ that is in communion with Satan. We find Pentecostal Christian denominations being in the forefront of this reawakening of witchcraft persecutions. This is perhaps most salient in the region of Congolese Africa where a hunt for witches is done in order to explain misfortune. Their methods count amongst exorcisms, drowning and trepanning – to create holes in the skull of the witch to let the evil out – or torturing the accused so the demon is forced to flee from the agonizing flesh of its host. Such matters only continue the misunderstanding and repeat the failure of understanding the nameless art. The witch, as Robert Cochrane saw it, was a searcher for Truth – someone that aimed to be in constant communion with the wisdom of the world. To understand Fate and know how to bend and use her – and to follow her – well, that is the work of wisdom – and wisdom, true wisdom, will always make the seeker humble in the unfathomable storms of light and understanding that is the landscape of the witch. The ‘witch’ do not worship anything – but he or she pays reverence to all things. It is about realizing that if something is – it also hold a meaning, no matter how inferior or exalted – and in this we find the personal worth. The witch is its own axis and creator of its own world – a promise of possibility given to all children of God. The successful execution of one’s Fate rests in one’s ability to understand the world of matter and the Heavens – but as they both mirror each other and we are material beings with a soul fallen in flesh matter is important. In matter we find joy, purpose and the golden tracks of the stars everywhere. We see God as deus otiosus - but without necessarily ascribing to Deism. This stance often lead to witches’ being seen as pantheists – and this is perhaps true. Personally I adhere to Plato’s reasoning that see in the works of nature the divine play – but this does not mean that I see a plurality of gods in nature as such – but I do see the work of God as intelligent signatures everywhere – but I have little need for turning this into a religion. It is more about a perspective upon the world – a living and vibrant philosophy of meaning and being. What I see is a nature endowed with divine sparks, so by knowing nature we can know God – and in this we can know origin and ourselves. In this premise we find the craft of the witch. Our rituals are focused on connecting with the land and to understand what spirits of nature are around us – and none of them are subject for worship – but yes, reverence, while others are not. In this we see a pragmatism occurring from the land itself and what is around the witch. For the witch the home is a haven and it is cathedral and refuge. Like any sage made its still centre, its palace or fortress in the wilderness of ambiguity, so does the witch. The rituals pertaining to traditional witchcraft do not make part of a system as such – it is rather a technology in its Greek sense of ‘techné’, a specified and purposeful work related to circumstances. Techné in this context refers to the ‘orgia’, or ‘ritualized wonderworking’s’ – again in reference to the Greek meaning - and not the modern hedonist one. So, to give ritual examples of what witches do will always be a shortcoming. The witch do what is necessary when need informs through the work and influence of Fate. Hence it is this that lies at the root of what witches do – and in this there can never be one format valid for all – rather need, geography and soul in tandem with spirit is what dictates the temporary corpus of rite and practice. There were tendencies in the 50’s and 70’s to disclose what witches’ did, in particular the works of Gerald Gardner and Janet and Stewart Farrar – and in this also surfaces so many matters that meet and part. It is here we see the first bold steps towards the formation of Wicca becoming a nature religion with fertility at its centre. 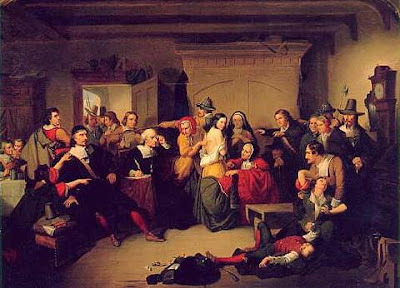 Recent research, by Philip Heselton and Michael Howard has given us proof that Gardner was indeed admitted to a group of traditional witches’. It has also been said that he found the teachings to provocative to reveal. If we look at the first drafts of Gardner’s ‘Book of Shadow’ we find that there is a few elements that do belong to the array of witchcraft proper, which is the Horned God and the Lady of the Woods. For Gardner this was set in the context of fertility – which is not wrong per se – but perhaps limited as he was clearly speaking of the Lord and Lady of Greenwood that calls upon the rain so they can make fertile wood and land. This is like taking a small segment of nature and place it within a new context and give it more global dimensions – which again is not wrong, but limited. Witchcraft is about expansion, not enclosure; it is not the walls of the city but the endless pastures that enthrall the witch. It is the possibility of Fate’s unfolding. The witch is the liminial and untamed that marks the borders of lawful and forbidden and disintegrates it all in favor of the one path unique so you can walk the track Fate gave you. It should also be noted that in the Craft proper – as in Wicca the female potency holds a unique position. In the mythos of several European Craft groups, woman is given reverence by being the spirit of Nature her self – whilst in other groups it is common to give particular importance to Lilith, Na’amah or similar tutelary deities as the progenitor of the witches’ race. Woman is seen as the plethora of Fate herself, the first fire. She is the fire of the home and of the womb. She is what is not we would not be… In Wicca this particular reverence has taken the shape of worship of the Goddess – and in this a more religious turn has been taken. All of this so far written here finds a reference in the person of Austin Osman Spare. Spare is today largely seen as responsible for the creation of Chaos magic – but in truth this was the work of Pete Carroll. And this is quite intriguing, because in the person and work of Spare we see how the witch stretches across boundaries and make all and nothing its own. Spare maintained his own private centre, a recluse that nevertheless inspired both with and against his own orientation. In this he manifests the nature of the witch as a turncoat and creative fire in constant rebirth. Let us take psychology. Spare was intrigued by it. He read and re-read Freud and Jasper and constantly opposed, becoming a silent voice in psychotherapy no one took into account - at least not yet. Spare took the land of the psyche and wrote the witches’ runes over it. Likewise he took the ideas of Agrippa concerning the magical alphabet and turned it into a language for the psyche and sub consciousness In doing this he were prefiguring people like Jaques Lacan who insisted on the importance of the unique language of the patient for developing good therapy. Spare’s alphabet of desire was used to form sigils of intent that was lodged within the shadows of the psyche and from reloading it within the forgetfulness of the psyche it would work its way to manifestation. It was a practical method aiming towards practical and material results. This technique was adopted by Pete Carroll when he founded IOT (Iluminates of Thanateros). He took on Spare as one of many inspirations for the quintessential focus at the founding of the order. Thanateros being a term used by Spare in relation to the technique of manifestation called ‘the death posture’ underlying the quintessential orientation of IOT’s founding. Spare did influence a lot of the occult counter culture in the 70’s, 80’s and 90’s. Of those in particular TOPY (Temple ov Psychick Youth) where the admission consisted in a 23 months long Spare inspired working. It is also worthy to mention the interest Alan Moore holds for Spare – hence he took Spare into the world of comics and occult fantasy. Spare was for a short time involved with Crowley’s AA but concluded that this was not for him and left this after a few months and refrained after this from participating in any order, group or coven. He did meet famous occult personalities at the time, like Gerald Gardner whom he was quite unimpressed by (Grant: Zos Speaks. 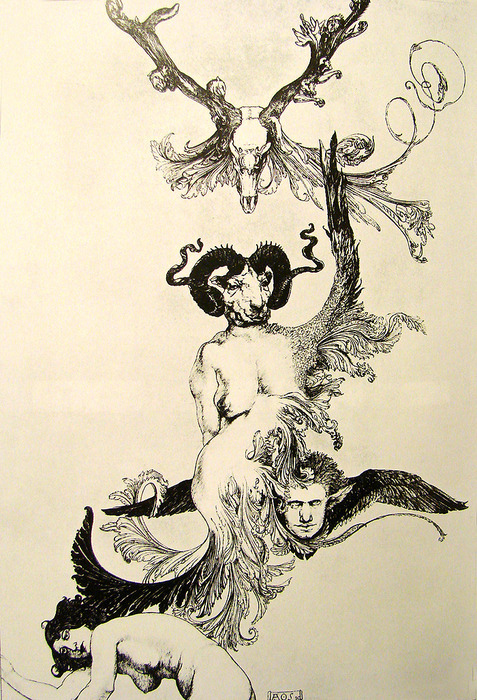 Fulgur 2006) and Aleister Crowley, whom he seemed to think was quite a foolish – but entertaining figure (Phil Baker: Austin Osman Spare. 2011). He became an inspiration for modern magicians – but he himself was a man apart from it all. I believe this is largely because of Spare’s take on art and psychology. He took the terminology of psychoanalysis and turned everything into an oneiro-sexual formula for self transformation and truth – resting on a raw pulse of magical quintessence. We are speaking of a unique and primordial perspective – the hallmark of a witch – a matter rarely remembered when his name is mentioned. Spare said to have been initiated at the age of 14 by ‘Mrs. Paterson’ and the memory of this encounter is encoded in the obscure text ‘the Witches’ Sabbath’ (Fulgur. 1992). This short text is presenting in argument and riddle the basic mysteries of the importance of the ‘Sabbath’ for the Witches and it is quite clear from the text that Spare experienced through the mediation of ‘Mrs. Paterson’ the genuine encounter with an art so often misunderstood and misrepresented. In this we have then the academic study of witchcraft where we perhaps find the contrasts in the works of Carlo Ginzburg and Ronald Hutton. The latter goes from the large strokes to the details and the former is occupied with the greater strokes that tell us something more general. They both represent important contributions on the study of witchcraft – but it is also clear that a material study of what is nameless and often veiled in secrecy do have its limitations. A problematic issue in both cases is that academia in this regard is largely relegated to history and history is about judging facts, written (in all forms of textual legacy) or manifest (partly the field of archeology). Rarely do we find attempts of researching the world view in the field of historical investigation, but of course, Armando Maggi, Jacques Le Goff and Charles Taylor have contributed with valuable – alas, often overlooked, research in this regard. What these academics did was to accept the pre-modern world view of the studied as crucial for saying anything useful about the subject. So, from this we have the tantalizing discourse of Taylor delving into the enchanted world of witches and the studies of the medieval imagination by Le Goff. When it comes to the academic study, of the formal premises and the logic of witchcraft – we need to keep in mind that it is pertinent to the Craft to escape any interpretation and label given to it. The art is nameless – and traceless. It is the gospel whispered in the acorns wind and it is the murmuring psalms of ravens and woodpeckers. It is the secrets imprinted on blood and earth by trees, stars and men and the spells written in the sand as the vipers walk the lands. So, we must take as premise for ‘witchcraft’ that it is a poetic reality and because of this a study of the Craft insisting on providing evidence in terms of historical facts will only present a distorted part of the truth. The study of witchcraft is also the study of imagination – the pre modern imagination that saw the world as an enchanted place, where the visible and invisible were constantly touching each other, where reality was not defined by optics – but by all senses. In the pre-modern world the experiment were not only regulated by quantitative rules – because in an enchanted world, also the invisible world were reliable factors in the experiment, as is evident in the works by Francis Bacon. This must lead us to conclude that, if we want to study witchcraft, we need to establish the reliability of the tools we will work with – and in this case, we set out to study what is nameless, what is shrouded in myth and poetry, memory and a world view seen as arcane and hopelessly outdated and unscientific by the modern standards. If this is the premise the researcher is already infesting its study with academic bias revolving around research prejudice – and the work will aim not towards understand, but to limit and falsify. So, in the end I say with Sigmund Freud: “wherever I go I find that a poet has been there before me”.